The mechanisms underlying soil organic carbon (C) dynamics during forest succession remain challenged because amount, quality, and composition of C inputs change with tree growth and species composition. Soils were collected from two stages (grassland and young secondary forest) of secondary succession after the clear-cut of primary old-growth forest due to land-use change, with a native old-growth forest (undisturbed for more than 200 years) as the reference. Soil samples were incubated for 170 days and the priming effects were quantified by one pulse addition of 13C-labeled glucose. 13C-PLFAs (phospholipid fatty acids) were analyzed to identify microbial functional groups utilizing glucose and to explore their accordance with SOM priming during succession. Soil C was primed much more strongly in young secondary forest than in grassland or old-growth forest. Priming resulted in large C losses (negative net C balance) in young-forest soil, whereas C stocks increased in grassland and old-growth forest (positive net C balance). Microbial composition assessed by PLFA and utilization of easily available organics (13C-PLFA) indicated that fungi were mainly responsible for priming in young-forest soil. Consequently, labile C released by litter decomposition and root exudation together with the availability of soil nutrients determines microbial functional groups that decompose soil organic matter during initial succession. 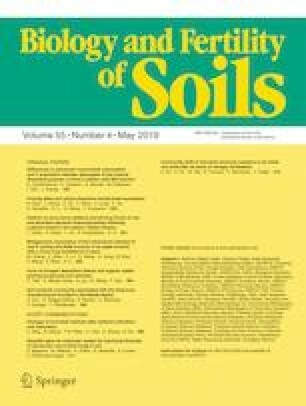 These findings provide novel ecological connections between soil organic matter dynamics and C (de)stabilization with microbial functioning during forest succession and show that priming direction and intensity is important to distinguish soil C dynamics in young- and old-growth forests. The online version of this article ( https://doi.org/10.1007/s00374-019-01351-0) contains supplementary material, which is available to authorized users.